Keep on keepin’ on! Love your flag & your style! Thanks Catherine! We plan on it!!! Some people just have no pride. Happy seeing you wave our flag! Some people are just “Odd Ducks”….. When has patriotism been disrespectful? This is the USA, we are not apologetic, we are Texans and proud! Fly the flag. Viva Jamie and James! Well, I knew the Texans would all agree with us!!!! Amen! My husband and I have his great-grandfather’s infantry division American flag from the Civil War with his name stenciled on it. We need to have it framed before it starts to fall apart. It’s in very good shape. It is very expensive to have one this size framed correctly, so we keep putting it off. Maybe we’ll get it done this summer. It sounds awesome. Take it to a small framer to get a quote on framing. Those BIg Name places can be crazy-pricey sometimes. and y’all display it beautifully. Here, Here! 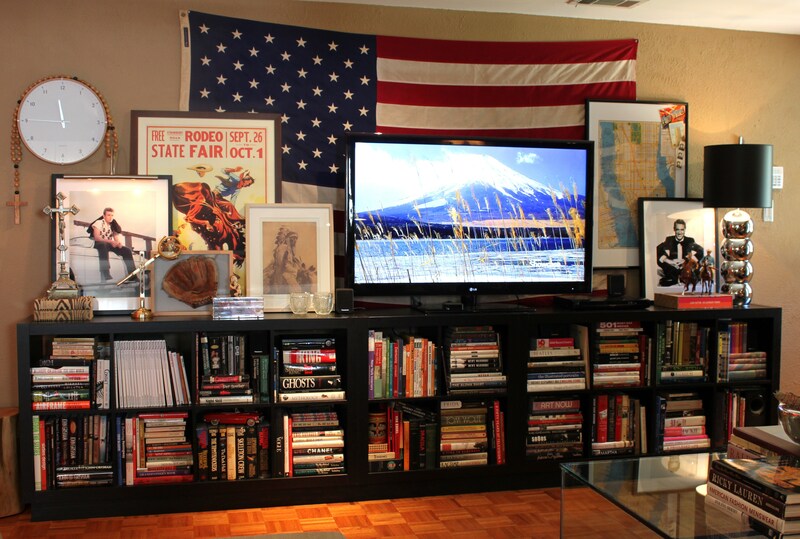 I’ve had that flag on a wall somewhere for about 20 years. Isnt the American flag a symbol of the awesome melting pot that we live in? 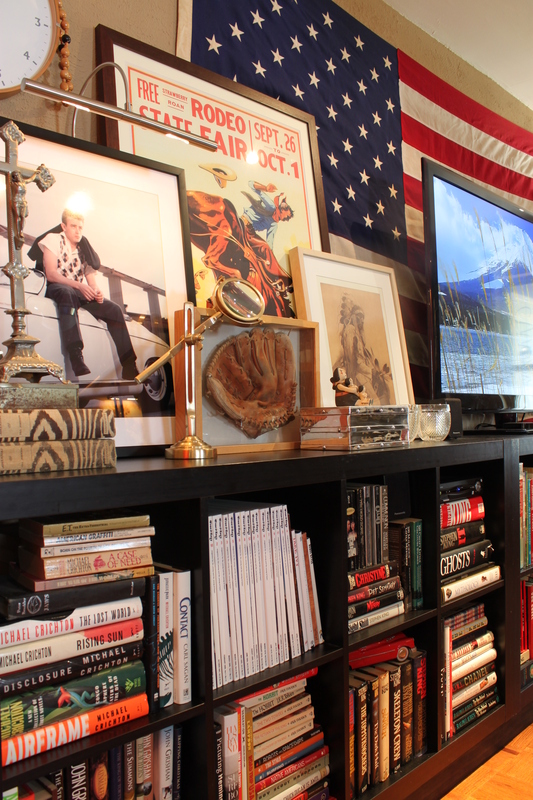 I, thought, that Apartment Therapy, was based out of NY… Forgive me if I am wrong. But, yes, I agree, nostalgia and symbolism flows free for all, with the American flag. I am very surprised by the comments on Apartment Therapy. They don’t sound like happy people. I agree with K. How can displaying the flag and love of country be disrespectful? Oh well…glad I am out here in W. Texas. Apartment Therapy has some of the “judgiest” readers. One woman couldn’t believe how many coats we own. Really? You feel a need to tell me that we have too many coats? Weird….. So. I’m assuming the haters are of the “more patriotic than thou” political persuasion. You know, the “get off my lawn” demographic, the “outrage du jour” crowd. Hope I spelled du jour correctly. If not, you still get my point, no? Just because someone is offended doesn’t make them right. Love your patriotic displays of our beautiful flag. I have them on our deck, mixed in with flowers on the front porch and out in the garden. I get goosebumps every time I hear our National Anthem! Those are probably the same people that don’t want our children in school saying the Pledge! Exactly! I love that moment at a baseball game when everyone sings the Anthem! Goosebumps every time. Criticism should be reserved for those ignorant of flag etiquette. A neighbor flew a flag until it was filthy and tattered. That’s just awful. Rock on with your flags! …or the businesses who fly the American flag below another…. 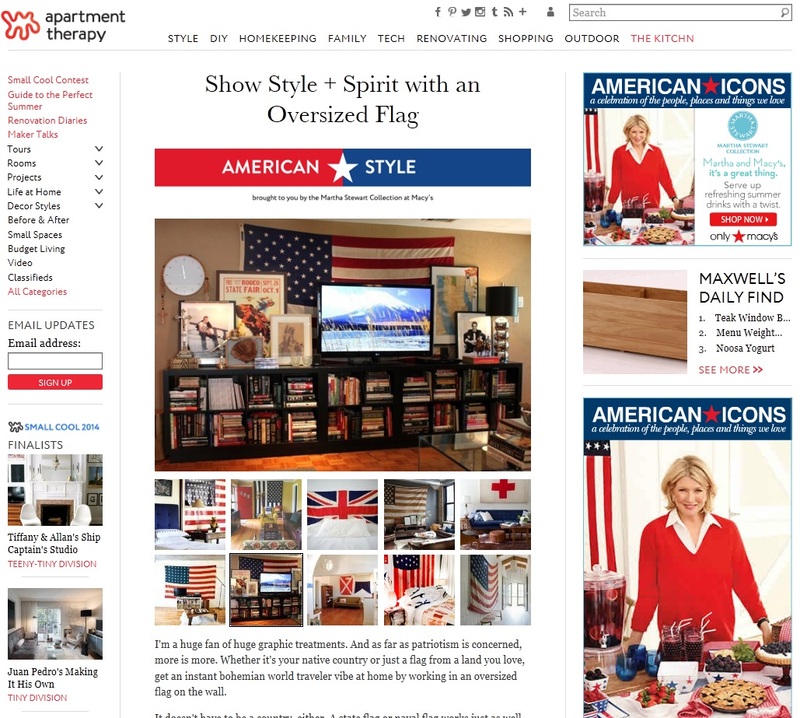 OOOhh BTW, look at that Martha Stewart add next to the Apartment Therapy post……pretty sure the flag behind her is hung wrong. The field of stars is always to the left. Same here Betsy. Only showing some love! How totally bizarre! I had never heard of that flag etiquette. Keep on keeping on, guys! And if the haters want something to hate, they should focus on the flag shorty shorts of the guy who used to run around the lake by our house. Always in the same shorts, shirtless, with his long blonde hair flowing. We called him ‘Fabio.’ THAT was a possibly bad use of the flag. YOURS is just completely awesome! Elise!!!! You are crackin’ me up!!! Fabio!!! Bet those shorts were pretty “funky”! Sounds like a direct violation of flag etiquette if I ever heard of one…..Fabio!!!!!! America needs a little more flag-flyin’, saluting, anthem-singing, and good ol’ American spirit. It’s time to rally the troops and positively support our country (think after 9/11) and stop the bashing that has permeated our spirits. Good for y’all! If I had an antique one, I’d hang it up too.